Along the history of human civilization, the sun has been the most visible entity that has commanded manOs awe, gratitude, reverence and worship. Most emerging religions of the world have drawn from this original source of inspiration. Just like the shared sense of time, the rhythm of day and night, the rotation of the seasons the sun will continue to illuminate and unite us as children of one Supreme source. Science has recognized this great ball of fire and energy to be an exploding furnace of helium and Hydrogen, without which nothing on earth can thrive or survive. But beyond the physical harnessing of solar energy, where the sun is the Godhead, lies the final frontier of manOs destiny. Beyond the myths of Egypt, Babylon, Persia, and Peru. Beyond the antiquities of SolomonOs Tempe, Stonehenge, and the sun temple of Konark beyond the mysteries of astrology, lies the preordained tryst of mankind with its most original perception of divinity: the light behind the sun, the spirit within the fire the resplendent form of the benevolent mother of the universe who as we know her is Gayatri. Widely acclaimed in India, The Gayatri MantraOs Supreme status is further enhanced by Lord KrishnaOs proclamation in his spiritual discourse, the Geeta, that among the mantras he is Gayatri. Our earth life being a material manifestation of the supreme solar power Gayatri, it follows that the Gayatri Mantra exerts its influence over various levels of existence: physical, mental, and emotional. Therefore, irrespective of our cultural learning or spiritual beliefs, regardless of our religious faiths, if we choose the Gayatri Mantra, to chant, absorb and meditate upon, it has power to open up the floodgates to the highest intellectual and creative capacities. In our experimentation with the mantra, we might possibly experience divine bliss, leading us to spiritual ascent in this world, and beyond. In defiance of the contemporary and ominous pointers to global calamities, we believe that the Gayatri Mantra can make even the non believer, a believer in his own potential divinity. 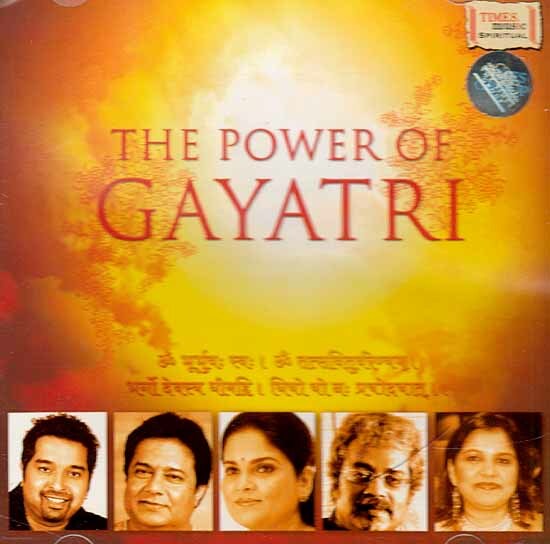 In this album Gayatri mantra is sung by some of the biggest artistes of this era like Hari Haran, Devaki Pandit, Anup jalota, Sadhana Sargam and Shankar Mahadevan and it also includes the instrumental version of this Divine Mantra. Also includes the instrumental version of this Divine Mantra. The mantra describes itself as, Oh, creator of the universe! We meditate upon thy supreme splendor. May thy radiant power illuminate our intellects, destroy our sins, and guide us in the right direction! Digitally Recorded at Ajivasan Sounds by Avadhoot Wadkar & Mandar Wadkar Music Arranged & Conducted by Ashit Desai Conceived and Produced by Hemant Mattani.